A veteran New York City journalist, Claire Hagen has learned not to trust everything she hears. So when her younger sister lands in a mental hospital after claiming a vampire is feeding off her blood, Claire is naturally skeptical. A search of her sister’s apartment convinces her: The delusions are a side effect of the drugs she discovers her sister had been taking.But a deeper investigation uncovers more than Claire bargained for. Why was a man who claimed to know her sister from an online vampire forum shot dead moments after Claire interviewed him? Why are her sister’s symptoms getting worse in the hospital? And why have agents from the Vatican taken a sudden interest in Claire?Consumed by doubt and growing paranoia, Claire barely has time to ponder her next move before a violent confrontation in her apartment changes everything. She quickly finds herself on the run with a mysterious stranger who says he wants to protect her but may not be quite what he seems. Can she trust him? For a good portion of the story in this novel, I was entertained. But the longer the story progressed, the more detached and less interested I became. By the time the end rolled around, I just didn’t care about the characters. While various portions of the story intrigued me, the narrative’s main flow felt too streamlined, structured, and shallow. I also depart feeling that the storyline was compressed. This is fifty pounds of story jammed into a twenty-pound sack. But Daniel Dersch shows promise, and I will be curious to observe his writing improve. He already does what many of his contemporary counterparts fail to do, which is to have a subject performing a verb upon an object. Dersch’s sentence construction is pleasing, and for what it’s worth, this small attention to good writing practice aided my enjoyment factor. I felt Clair Hagen was a little too stereotyped. She seems driven to prove her resourcefulness, but appears to yearn for a strong man. The “daddy” references got a little weird, but maybe we can chalk that up to this being a translated work. The chapters in this book denote a change in POV (point of view). At first I liked this alternating split narrative thing that Dersch pulls off. But the longer this unspooled, the shorter the chapters got, and all too soon the shortness of the intervals became a distraction. Amy McFadden narrates the audiobook, and at first I struggled with her rhythm and delivery. In the beginning, I thought her voice was grating. But the longer I listened, the more I felt McFadden captured the essence of Clair. Somewhere in the middle, McFadden won me over, and I think she does a great job with this audiobook. 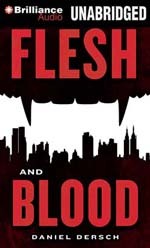 Fans of contemporary vampire stories will most likely enjoy this for what it is. The newly married super-couple, August Fenwick (aka The Red Panda) and Kit Baxter Fenwick (aka The Flying Squirrel), are returning from their honeymoon in Europe. It was a working holiday, but they’re looking forward to a relaxing flight home aboard a Zeppelin. But there is a mysterious passenger aboard, and she has other plans. Doctor Darius, an earnest rooming-house tenant with a “felonious past,” is having trouble paying his rent. If he can only perfect his “royal jelly” formula … well, let’s just say that not all super-villains, it seems, are motivated by megalomania. A fiendish deathtrap, in the form of a labyrinth, faces any victim of The Puzzle Master. Can RP and FS, with the help of “Doc Rocket”, navigate the maze? An amnesiac awakes in a dark alley. He meets a young woman, she wants to help, and he’s definitely in need of it. Meanwhile, the Red Panda is hunting for someone or something that poses a threat to someone or something somewhere in Toronto. It’s a mystery! It’s a love story! And it has all got to end either with a bang, a twist, or in tears! An old debt must be repaid with a trip to New York City. But unlike in Toronto, NYC has licensed superheroes, the mayor has given them badges and charged them with tracking down one of their own. But two crusaders from the Great White North don’t need no stinkin’ badges. A cold spell, and a series of suicides isn’t likely to be a dastardly plot. Not during the 1930s depression. But when those suicides coincide with a series of disappearances then a certain something must be up. Right? Add in a snake cult and this looks like a job for a certain married couple, in thermal tights! A dozen unsolved “society” kidnappings are followed up by an “impossible” $80,000 jewel robbery – the police are baffled but Red Panda (and wife) are on the case. Perhaps one jocular simian and his Oliver Twist-like crew are responsible? A stakeout, some “ritualistic nonsense” and a gravelly voiced villain leading a covert cabal of criminal creeps may spell the extermination of both Panda and Squirrel. Can anyone stop The Red Panda Revenge Squad? A Caribbean vacation for Mr. and Mrs. August Fenwick is cut short when a Havana based pleasure boat, reported in distress and then missing, proves irresistible to this power couple. Could a mysterious high pitched cry, and an inconspicuous island deep in the epicenter be signs of a secret testing base? But testing for what? And for whom? Late one night in Los Angeles two security guards pass the time by talking. One has a strange tale to tell. It seems there was once an uninhabited island off the coast of India. On that island was an ancient ruined city. In that city was a certain eldritch idol. And that idol had two jewels for eyes, now called the “Eyes of Doom.” Now one of the guards has one. Two means doom. Is it only coincidence when Fenwick Industries is plagued by accidents? After all, accidents happen. But sometimes accidents aren’t actually accidents at all! And a sniper assassin is no kind of accident. Its all very hush hush, but what exactly does the suspicious Colonel Fitzroy know about it? 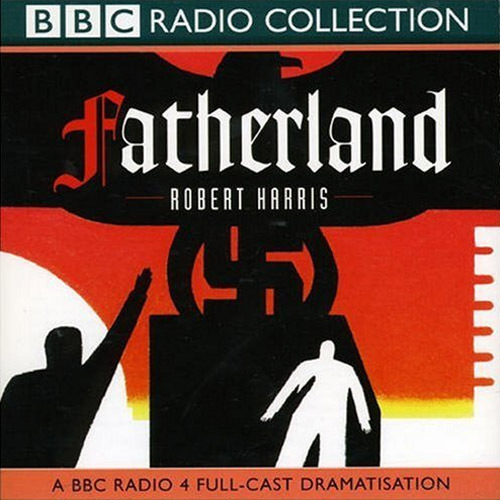 Set in late August 1939, with a recently signed non-aggression pact between the Third Reich and the Soviet Union. One hero, and her husband, will fight one final holding action in a losing war, the Occult War. Their opponent is Professor Friedrich Von Schlitz and a division of SS scum. 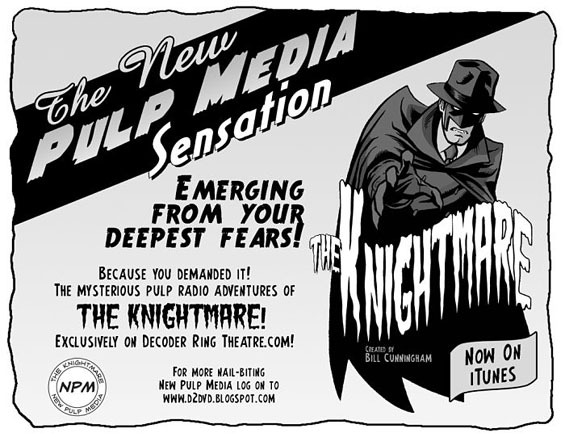 The man behind this production, Bill Cunningham, says that “The Knightmare is a hero cut from the same cloth as The Shadow or The Green Hornet.” Not unlike Decoder Ring’s Red Panda himself! 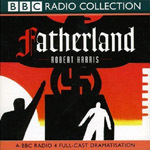 In this 2-part episode, The Knightmare is fighting Hollywood gangsters, Hollywood cops and Nazis (probably not from Hollywood). Unlike RP this story is set in Los Angeles. Here’s a downloadable sample from the intro to the show |MP3| and |HERE| is the full press release.